Brayman, Harold. The President Speaks Off the Record. Historic Evenings with America's Leaders, The Press, and Other Men of Power at Washington's Most Exclusive Club - The Gridiron. From Grover Cleveland to Gerald Ford. Princeton. Dow Jones. 1976. 870 pps. Octavo. Hardcover. First edition. Illustrated. Fine copy in worn dust jacket (in mylar). Brecher, Elinor. Schindler's Legacy. True Stories of the List Survivors. New York. Plume. 1994. Octavo. Soft cover. First edition. Illustrated. Fine copy. Breemer, Jan. U.S. Naval Developments. Annapolis. Nautical and Aviation Publishing Co. 1983. 194 pps. Octavo. Hardcover. First edition. Fine copy in fine dust jacket (in mylar). Bregman, Ahron. Israel and the Arabs. An Eyewitness Account of War and Peace in the Middle East. New York. TV Books. 2000. Octavo. Soft cover. Reprint. Illustrated. Very good copy. Light shelf wear. Breitman, Richard. Official Secrets. What the Nazis Planned, What the British and Americans Knew. New York. Hill and Wang. 1998. 325 pps. Octavo. Hardcover. First edition. Fine copy in fine dust jacket (in mylar). Breitman, Richard. The Architect of Genocide. Himmler and The Final Solution. New York. Alfred A. Knopf. 1991. Octavo. Hardcover. First edition. Fine copy in fine dust jacket (in mylar). Brendon, Piers. 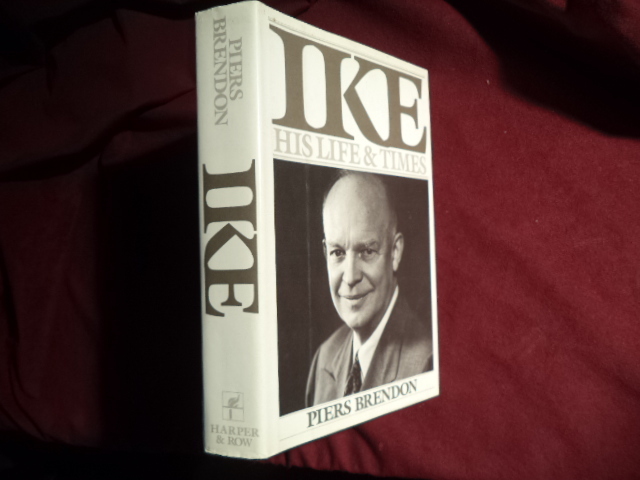 Ike. His Life & Times. Photo available. New York. Harper and Brothers Pub. 1986. 478 pps. Octavo. Hardcover. First edition. Illustrated. Fine copy in near fine dust jacket (in mylar). Brennecke, Gerhard. Die Nurnberger Geschichtsentstellung: Quellen zur Vorgeschichte und Geschichte des 2. Weltkriegs aus den Akten der deutschen Verteidigung. Deutschen, Hochschullehrer-Zeitung. 1970. 428 pps. Octavo. Hardcover. First edition. Near fine copy (very light shelf wear). Brenner, Eliot. Desert Storm: The Weapons of War. New York. Orion. 1991. 96 pps. Octavo. Soft cover. First edition. Illustrated. Fine copy. Brenner, Lenni. Zionism in the Age of Dictators. A Reappraisal. London. Croom Helm. 1983. Octavo. Soft cover. Good copy. Covers lightly damp stained. Breuer, William B. Death of a Nazi Army. 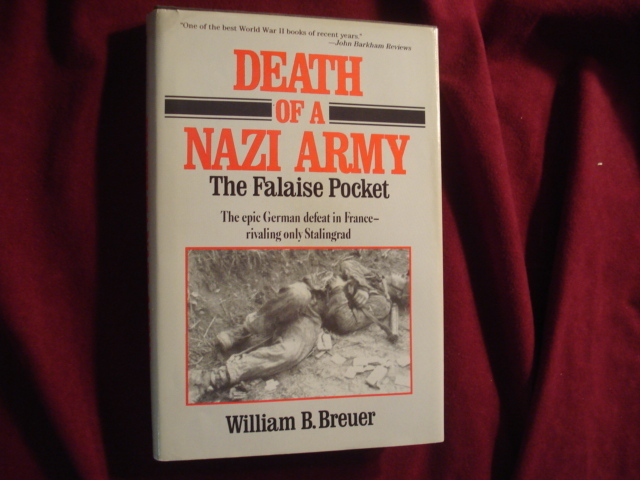 The Falaise Pocket. The Epic German Defeat in France - Rivaling on ly Stalingrad. Photo available. np. Scarborough House. 1985. Octavo. Hardcover. First edition. Illustrated. Fine (owner name on end paper) copy in fine dust jacket (in mylar). Breuer, William B. 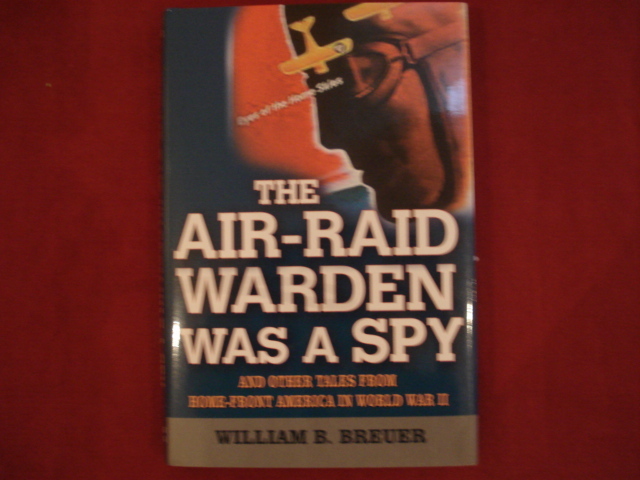 The Air-Raid Warden Was a Spy and Other Tales from Home-Front America in World War II. Photo available. Edison. Castle. 2003. Octavo. Hard cover. First edition. Illustrated. Fine copy in fine dust jacket (in mylar). 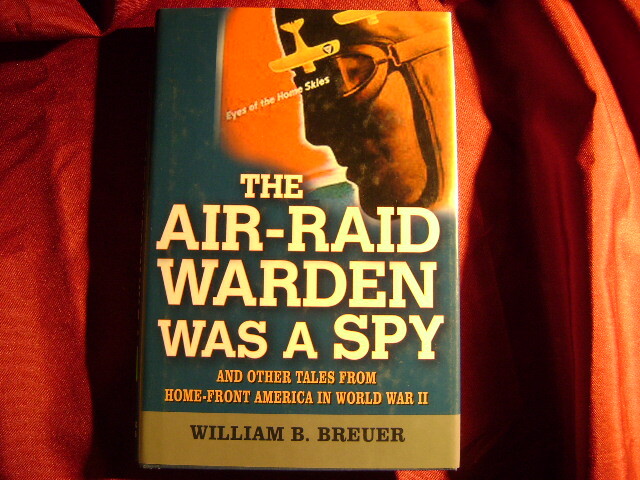 Breuer, William B. Unexplained Mysteries of World War II. Photo available. New York. John Wiley & Sons. 1997. Octavo. Hard cover. First edition. Illustrated. Fine copy in fine dust jacket (in mylar). Breuer, William. Hitler's Fortress Cherbourg. The Conquest of a Bastion. The Bloody Battle that Saved the Normandy Invasion. New York. Stein and Day. 1984. Octavo. Hard cover. First edition. Illustrated. Fine copy (owner blind stamp) in fine dust jacket (in mylar). Breuer, William. MacArthur's Undercover War. Spies, Saboteurs, Guerrillas, and Secret Mission. New York. John Wiley & Sons. 1995. 257 pps. Octavo. Hardcover. First edition. Illustrated. Fine copy in near fine dust jacket (in mylar). Breuer, William. The Secret War with Germany. Deception, Espionage, and Dirty Tricks. 1939-1945. Novato. Presidio. 1988. Octavo. Hard cover. First edition. Illustrated. Fine copy (owner blind stamp) in fine dust jacket (in mylar). Brickhill, Paul. The Dam Busters. 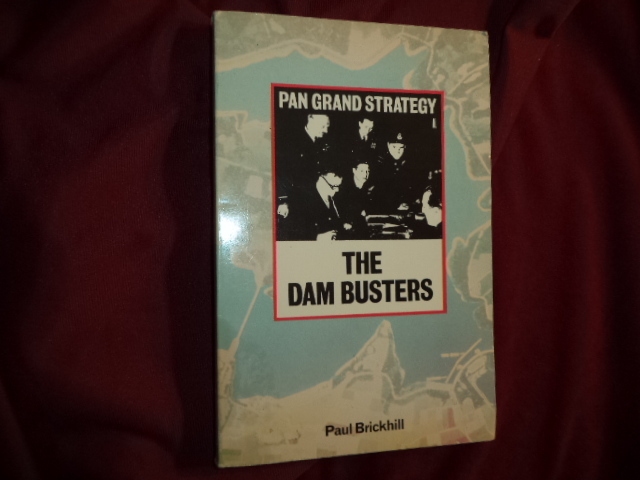 Pan Grand Strategy. Photo available. London. Pan Books. 1978. Octavo. Soft cover. Reprint. Illustrated. Fine copy. 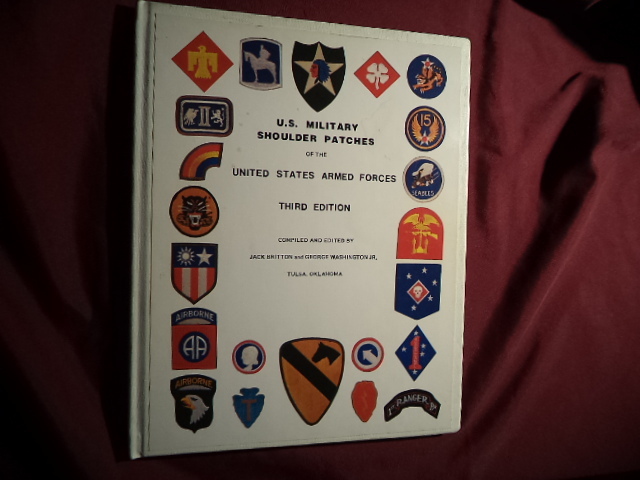 Britton, Jack & George Washington Jr. U.S. Military Shoulder Patches of the United States Armed Forces. Photo available. Tulsa. M.C.N. Press. 1981. 76 pps. 4to. Hardcover. First edition. Illustrated in black, white and color. Important reference work. Fine copy. Brokaw, Tom. The Greatest Generation. New York. Random House. 1998. 412 pps. Octavo. Hardcover. Reprint. Illustrated. Fine copy in fine dust jacket (in mylar). Brook-Shepherd, Gordon. Between Two Flags. The Life of Baron Sir Rudolf von Slatin Pasha. New York. G.P. Putnam's Sons. 1972. Octavo. Hard cover. First edition. Illustrated. Fine copy (owner blind stamp) in fine dust jacket (in mylar). Brooks, Lester. Behind Japan's Surrender. The Secret Struggle that Ended an Empire. New York. McGraw-Hill. 1967. Octavo. Hardcover. First edition. Illustrated. Fine copy in fine dust jacket (in mylar).